The U.S. Geological Survey (USGS) measures discharge in streams using several methods. However, measurement of peak discharges is often impossible or impractical due to difficult access, inherent danger of making measurements during flood events, and timing often associated with flood events. Thus, many peak discharge values often are calculated after the fact by use of indirect methods. The most common indirect method for estimating peak discharges in streams is the slope-area method. This, like other indirect methods, requires measuring the flood profile through detailed surveys. Processing the survey data for efficient entry into computer streamflow models can be time demanding; SAM 2.1 is a program designed to expedite that process. The SAM 2.1 computer program is designed to be run in the field on a portable computer. The program processes digital surveying data obtained from an electronic surveying instrument during slopearea measurements. After all measurements have been completed, the program generates files to be input into the SAC (Slope-Area Computation program; Fulford, 1994) or HEC-RAS (Hydrologic Engineering Center-River Analysis System; Brunner, 2001) computer streamflow models so that an estimate of the peak discharge can be calculated. This is a .zip file that contains the computer program, example data files, and a help file. 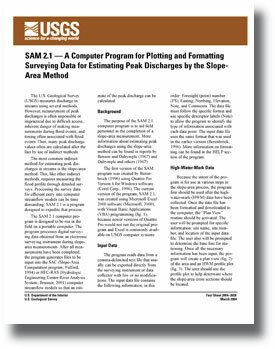 Hortness, J.E., 2004, SAM 2.1—A computer program for plotting and formatting surveying data for estimating peak discharges by the slope-area method: U.S. Geological Survey Fact Sheet 2004-3028, 6 p.